Christina Massey’s work teeters of the edge of both painting and sculpture. The beginning stages of her creative process are all sculptural. It develops from choices about materials, form, texture and shape before paint is applied covering the surfaces with painterly gestures. 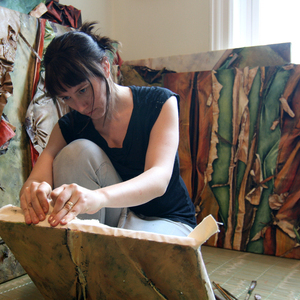 Her work is highly intuitive, reacting to the materials and building upon them as the work evolves. Her work indulges the senses with an overload of aesthetic qualities like textures, color, form and pattern. Artists such as John Chamberlain, Susan Bengali, El Anatsui and Janine Antoni have influenced her work. Massey’s work shares a sensitivity to materials, form and process with an inspiration from textiles and repurposed products. She blends and blurs the lines between sculpture and painting in her colorful, abstract, textural, three-dimensional artworks.